Dainess (pronounced Di-ness) went shopping a week ago, Wednesday. 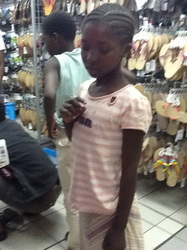 She had a great time and got a skirt, shirt and a pair of shoes. Then we went to the grocery store and bought a 10 Kg bag of Mealie-meal (the local staple food,) potatoes and a bag of apples. It was a very good afternoon. Dainess was at school the next 2 days and everything seemed normal. The following Monday morning we received some very sad news from Dainess’ good friend Mirriam. Here is what happened…. 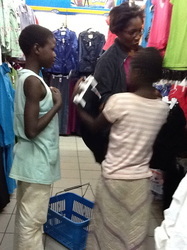 Two days after the shopping (last Friday) her grandmother ‘chased’ her. ‘Chased’ is the term that Zambians use for ‘kicked out’. Because the school was closed, Dainess didn’t know where to go. We found out the following Monday that Dainess spent Friday night sleeping in a small outdoor fruit stand. This is an open building about the size of an outhouse! In the morning, the woman who owns the stand found her sleeping there. This woman took her in and kept her safe Saturday and Sunday. Dainess went with the aunt. Mary has kept touch over the last couple of days. She told the aunt that if Dainess wasn’t attending Appleseed, then she could not remain in the sponsorship program. It would be much too difficult for us to keep track of what is happening with her if we do not see her on a regular basis. This weekend Mary talked to the aunt again. She said that she would talk with the other relatives in the village (where the grandma wanted to send her) and tell them that she was going to take Dainess back to the last (Mary) so that she could continue her school and her sponsorship. We want you to know, Sophia, that your sponsorship has possibly saved Dainess’ life. Without it, we wouldn’t have found out that she was being abused and living a terrible life. Now, we have been able to get her out of the hands of the people who were hurting her. 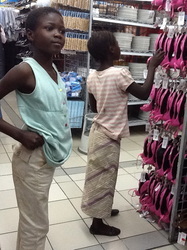 As long as the relatives allow her to come back and live with Mary, she can continue to be sponsored. We hope that this happens. However, if they refuse, we will have to remove her from the sponsorship and hope that you will choose another child. I think though, that it will work out and she will return. We will keep you posted.